The Task Force was created in 2007 to monitor Millennium Development Goal 8, Global Partnership for Development, specifically its five core domains, official development assistance (ODA), market access (trade), debt sustainability, access to affordable essential medicines and access to new technologies. This year marks the last of the series of this monitoring process with a closing report tracking 15 years of progress. As has been reported, there have been significant positive developments pointing to an effective international partnership in the five domains, but several deficits in development cooperation have continuously highlighted the need for a rejuvenation of the global partnership for development. 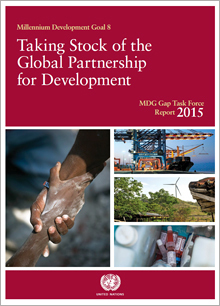 The 2015 Report continues to monitor the five core domains of the Global Partnership for Development, namely, official development assistance (ODA), market access (trade), debt sustainability, access to affordable essential medicines and access to new technologies, as prescribed by MDG 8. This year marks the last of the series of this monitoring process with a closing report tracking 15 years of the global partnership for development. As has been reported throughout the monitoring process, there have been significant positive developments pointing to an effective international partnership in the five domains, but several deficits in development cooperation have continuously highlighted the need for a rejuvenation of the global partnership for development. The report finds that ODA increased substantially over the MDG period, although ODA to LDCs has declined in recent years. Additionally, global trade of goods and services expanded significantly over the last fifteen years to more than USD20 trillion, with improved levels of participation by developing countries. However, a key challenge of MDG 8 has been the failure of the international community to conclude the Doha Development Round after 13 years of negotiation. This failure has had ramifications for the potential of trade as an enabler of economic growth and development. Debt relief initiatives have alleviated debt burdens of many developing countries, but the need for enhanced policies towards debt crisis prevention and resolution remains to address the concerns of other vulnerable countries whose debt problems remain unresolved. Monitoring studies on access to affordable essential medicines have repeatedly shown that, in general, access remains insufficient and, in particular, that generic medicines are significantly less available in public health facilities than in private health facilities. Finally, the report notes that access to new technologies, in particular information and communication technologies has grown tremendously since 2000 but these impressive gains observed during the MDG era continue to be marred by a digital divide between developed and developing countries.